Boy, oh, boy. Patrick Stewart’s one-man dramatic reading defines “A Christmas Carol” for me. It gets straight to the heart of the original, as I see it. Scrooge isn’t healed by the Christmas spirit…he’s healed because he’s forced to evaluate the bad choices in his life and to confront the ugliness inside him. Christmas, and the Spirits, don’t do anything to him; at the end of the story, he’s a better man because he chooses to become one…and all of that requires effort and honesty. Patrick Stewart’s performance as Scrooge makes it clear that we’re meant to cheer Scrooge on. Could we even go so far as to describe Scrooge as the hero of “A Christmas Carol”? Hmm. It depends on whether or not you think it’s heroic to rescue yourself, as opposed to saving, say, Lois Lane, Marion Ravenwood, or Christmas. I say “yes.” Scrooge examines his own behavior and ultimately, he decides to move away from a position of safety and comfort (the purpose of self-delusion is generally to trick us into feeling safe and comfortable, after all). He veers off into something more dangerous and uncertain. That might not be heroic, exactly, but at the very least it’s brave. And that’s why, when this story is adapted and performed as well as it’s done by Patrick Stewart, we like Scrooge and want him to succeed. Marley’s visitation scene makes Dickens’ intentions clear. Marley’s true burden isn’t the hundreds of pounds of chains and steel cashboxes he has to drag around everywhere: it’s his unrelenting remorse. Only after his death has Marley become aware of the depth of the suffering among the disadvantaged in the city. He’s eager to aid…but as a formless spirit, he’s powerless to interfere. All Marley can do is watch, and remember alllllll of the times during his life when he walked straight past the same kinds of people without paying them the slightest notice, and think about how he could have lifted them out of their desperate situations by applying the slightest effort. An eternity of compassion and remorse: that’s a tidy vision of hell. We come to learn that Ebenezer Scrooge isn’t a baddie. He just made the mistake of responding to disappointments by growing more cynical and suspicious of other people as the years passed. Eventually, he grew suspicious of Humanity in general. Ultimately, he distanced himself so completely that he withdrew from the whole system. Time and time again, he angrily demands to be left alone. He doesn’t even attempt to interfere with the good works of others, and (to my recollection) doesn’t even act in a meanspirited way. A thoughtless one, yes, but is he ever actively hostile? He wants the men collecting for the poor to go away. He doesn’t want to be roped in to his nephew’s Christmas party. He wishes that the carolers would just leave him the hell alone. In doing so, Scrooge failed to understand that you’re part of the human race whether you want to be or not. Therefore, the only choice any of us have in the matter is whether to play a positive role in human society or a selfish one. By the time Scrooge meets the Ghost of Christmas Future, he’s already realized the mistakes he’s made and the damage he’s done to himself and the people around him through his indifference and his total lack of empathy. And so, when he sees his name on the tombstone, he doesn’t plead with the Ghost because he’s desperate to save his skin. I think it’s clear that he was eager to finally use his resources (his money and his time on Earth) to become a positive part of society, and thought that the cup was being slapped away from his lips. He was like Marley in that moment: wanting to alleviate human suffering, but denied the ability. I could move on to a long debate about whether or not a desire to help others is, in fact, a selfish desire. But I’ve just checked carefully and it turns out that this here is a blog post and not a page of dialogue for Dr. House. Another win of this audiobook: it doesn’t shortchange us on the Christmas Day scenes. It wouldn’t be very satisfying if Scrooge woke up, undocked his iPhone from the nightstand charger, confirmed the date, PayPal-ed a bunch of money to some good causes, and then went back to sleep. Patrick Stewart doesn’t hold anything back. There’s a smile on Scrooge’s face and a gleam in his eye that comes through even in audiobook form. And yet, he doesn’t go overboard and destroy the effect of all the hard work that preceded that scene. The word to describe Scrooge’s emotions would be “grateful” rather than “manic.” We should be grateful that we have the time and the means to do something positive. This is a scene from the 1999 Hallmark made-for-TV movie. It’s a good’n; so good that it…no, no, surely not. No matter how good Stewart’s movie is, though, I can’t prefer it to the audiobook. Stewart has been regularly performing his abridged “Christmas Carol” as a one-man show since 1991. He does every voice! I invite you to wonder, as I do, how he compresses his rich, impressive King Lear-esque baritone into a charming Tiny Tim. I can assure you that he does. And when he plays female parts, it’s about as far away from a Monty Python pepperpot lady as one can get without leaving this planet. And when I hear those words, I feel pinpricks at the back of my neck and I am very, very happy. There have been years when I simply never got around to setting up the tree. Sending out holiday cards? I like to design those myself, which means that it only happen when I think of an idea early enough to have the cards made, and get the cards made early enough to address and mail them. But there is never, ever a year when I don’t listen to Patrick Stewart’s dramatic adaptation of “A Christmas Carol” at least twice. 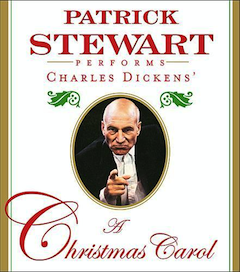 Patrick Stewart’s career is filled with indispensable work and even so, I would quickly choose “A Christmas Carol” the least-dispensable thing Patrick thing he’s ever done. So you should definitely get yourself a copy of this. If your holiday weekend plans involve driving all over creation making merry, you can choose no better car audio than this. Me? I bought and ripped the CD. That’s the highest tribute I can pay to any commercial audio. If an album’s good, I’ll buy a track or three. If it’s very good, I’ll buy the whole thing. If it’s as good as “A Christmas Carol,” though, I want the CD. I want the recording at its highest, uncompressed quality. I want it in an unlocked format that I can rip and then install on any playback device I own now or will ever own in the future. Buy “A Christmas Carol” from Amazon. As usual, my Amazon Associates ID is embedded in that link and any purchases you make on Amazon after clicking it results in my receiving a small kickback in the form of Amazon store credits…which I will spend on delightful foolishness. Er…I mean, food for hungry orphans.